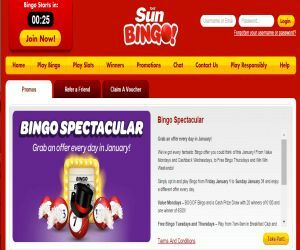 Sun Bingo's Spectacular Offers | Win a Prize Every Day! Sun Bingo is giving you plenty of reasons to smile throughout January, with a different Bingo Spectacular offer every day! You can also go crazy and grab cash back with Sun Bingo's Mobile Mad Weekends! With Sun Bingo you can beat the January blues with plenty of cheeky chances to win spectacular prizes every day until 31st January! You may need to clear your diary, so you can fill it with Sun Bingo's Spectacular schedule! So make sure you don't miss out on Value Mondays to scoop up to £500, or Cashback Wednesdays where you can grab 10% Cashback up to £25 on Bingo! Next up, you can also play Free Bingo Tuesdays and Thursdays in selected rooms like the Breakfast Club and Fashion Club, and join Win Win Weekends, where you can grab a sunny slice of the £1,000 prize each day! We know the weekend is the time to be out and about, whether it's to catch up with friends or family, do a spot of shopping, travel to the game or a big night out! If you're shattered from the week, then the sofa may be your new home for the weekend too! So with Sun Bingo, wherever you are, whatever you're doing, and even if you're having a mad weekend, you can earn some crazy cashback worth up to 10%! All you have to do play on the your Smartphone or Tablet every weekend until Sunday January 31st and wager £30 on Slots! You can then earn cash back on your losses, to have even more chances to play all over again!